Fences come in a lot of styles and materials. One of the most popular is the shadowbox fence. 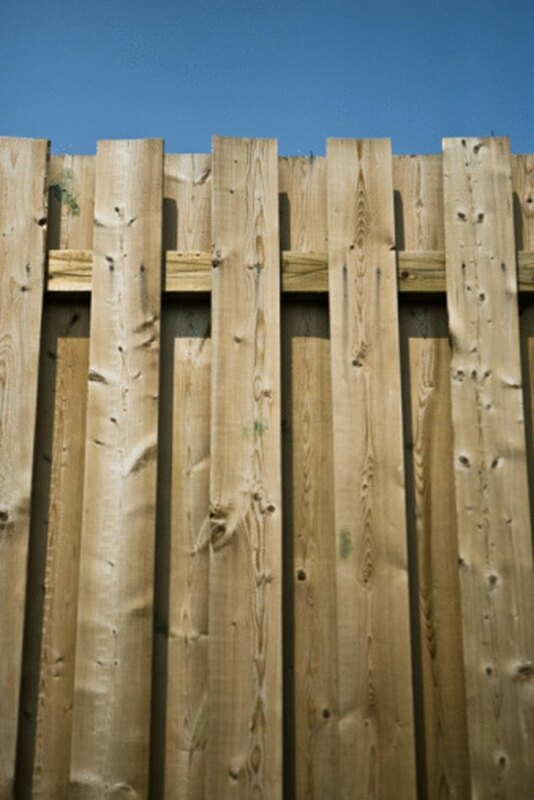 It's a handsome-looking fence design made from all-natural wood that can be stained or painted after installation. You can purchase pre-fab fence sections, but building a shadowbox fence from scratch -- though a bit challenging -- can be rewarding. A shadowbox fence offers both privacy and beauty. Measure the length of the fence to be installed and calculate the required materials needed. Estimate approximately 24 1-by-6-inch-by-6-foot-long boards for pickets per 8-foot section of fencing, three 2-by-4-inch-by-8-foot rails per section and two 4-by-4-inch-by-8-foot posts per section. Sink a 4-by-4 post every 8 feet. Dig post holes 18 inches deep with a manual post hole digger or a rented automated auger. Mix the quick-set cement per instructions on the bag. Shovel some into the hole, set the post in it and shovel more concrete around the post. Check that the post is plumb -- that it's setting straight up and down perpendicular to the ground -- by laying a carpenter's level against first one face of the 4-by-4 and then a second adjoining face. It should take just a minute or two for the cement to set. Repeat for all posts. Measure the first post from the top of the hardened concrete to a height of 5 feet 10 inches tall. Make a pencil mark . Place a metal square across the face of the 4-by-4 post and draw a line. Tack a small nail to the pencil line and tie on a string. Unfurl the string and walk to the last fence post. Hang a line level on the string and check for the bubble to rest in the middle of the level tube, indicating the line is now level. Tack a nail into the 4-by-4 and the tie string around it. Lay the metal sqaure against the face of each 4-by-4 where the string is touching and draw a line. Turn on the electric saw and cut each post off at the pencil line. Take three 2-by-4-by-8-foot boards that will serve as the horizontal stringers and lay them on the ground. Measure up 1 foot from the base of the concrete and pound in just one nail in so the 4-inch face of the 2-by-4 board is overlapping the face of the post by 2 inches. Lay a carpenter's level on the stringer to ensure it is level before nailing the opposite end of the stringer to the adjoining post -- add a second nail to each rail end. Measure 1 foot down from the top of the post and install a second stringer like the first one. Install the third one in the middle of the top and bottom stringers the same way. Install the first picket by setting it right against the 4-by-4 post. Make sure it is sitting 2 inches above the post. Set a carpenter's level against the outside edge of the picket and check it for plumb before nailing it to each of the three stringers using two 6d nails per stringer. Go one or two posts down and install another picket just like the first one, but only pound in one nail through the picket and into the top stringer but not all the way in. Tap a nail into the top edge of the first picket and tie a string around it. Unfurl the string to the second picket, hook a line level on the string to get it to level and if the second picket isn't at the same height as the first, pull it away from the top stringer and adjust its height. Pound in one nail, check the picket for plumb before nailing it to each of the three stringers with two nails per stringer. Tap a nail into the top edge of the second picket and tie a string around it. Now all the subsequent pickets will be brought to the height of the leveled string. Cut a 1-by-6 section of spacer board about 6 inches long. Lay this board against the edge of the first picket and set the next picket board up against it so the two pickets are one picket width apart from each other. Push the picket up so it's at the height of the leveled string. Lay the carpenter's level against the edge of the second picket to check for plumb and nail it to all three stringers. Repeat the full length of the fence. Extend the level line as you proceed. Repeat Steps 6 through 8 for the opposite side of the fence, except attach the first picket so it's centered right on the face of the 4-by-4 post. Position the next picket by placing the spacer against the edge of the first picket. Each picket on this side of the fence should be lined up in front of the gap between the two pickets on the opposite side of the fence. Check each picket for plumb and proper height before nailing to the stringers.